ItemI-51755 - "Women's Canadian Club members in dress rehersal for Women's Canadian Club pageant, "Victoria the Feminine". ItemI-51756 - "Women's Canadian Club members in dress rehersal for W.C.C. pageant, "Victoria the Feminine". ItemI-51758 - "HMS Trincomalee, deck view drawn by Harold Wyllie". ItemF-06336 - Photographer Richard Maynard with field camera on tripod inside Hannah Maynard's studio, Victoria, BC. ItemG-03300 - A photographer, possibly Arthur S. Rappertie, standing next to a camera on a tripod and timing a photographic exposure, Victoria, BC. ItemH-01219 - Arthur Vipond, Victoria, BC. ItemI-51946 - Chatelaine Lady Willingdon and unidentified women, including a nurse, on steps of a building at Tranquille Sanatorium, Tranquille, BC; Denman photograph no. 30, Album p. 20. ItemI-51947 - Dr. Lapp greets unidentified male and female visitors to Tranquille Sanatorium, Tranquille, BC; Tranquille album, p. 22. ItemI-51659 - Obverse of medallion with coat of arms and inscription "Province of British Columbia / Honourable E. Dewdney Lieutenant Governor". Item G-03300 - A photographer, possibly Arthur S. Rappertie, standing next to a camera on a tripod and timing a photographic exposure, Victoria, BC. 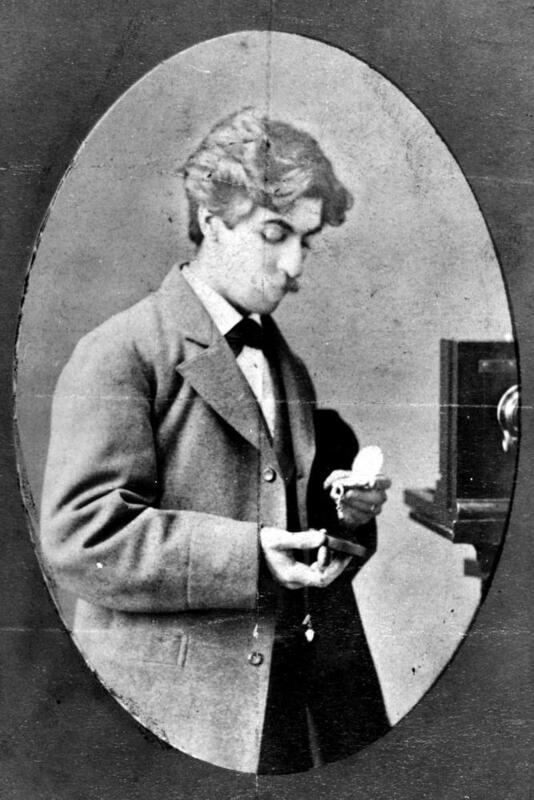 A photographer, possibly Arthur S. Rappertie, standing next to a camera on a tripod and timing a photographic exposure, Victoria, BC.